I have been greatly blessed the past few weeks, though I have been pressed to my limits at work. I have had a number of difficult situations at work with patients, insurance reviewers, and staff that have been quite distressing to me. But through it all I have been able to create beautiful art. I had a very fortunate thing happen to me the other day. I was interviewed by the Grand Rapids Press and they ran a rather long article on artists serving the church in the RELIGION section of the paper which was a wonderful article. I will provide a link to it on the website for those of you who would like to read it. However, the article mentioned that my work would be a part of the Celebration Exhibit which opened this weekend at I United Church. Well, wouldn’t you know it … the two artists interviewed for this article both were cut by the juror! It was ironic. But what was really ironic to me was that though it never feels good to be rejected from an exhibit, I was quietly at peace about the whole thing. I think the nice surprise of being in the paper more than made up for the disapointment of being cut from the show. The funny thing is, I have not sold anything for over two years now … and in my heart I know that I am creating some of my best work I have ever made. I don’t know what God is up to, but I am curious to see what comes next. 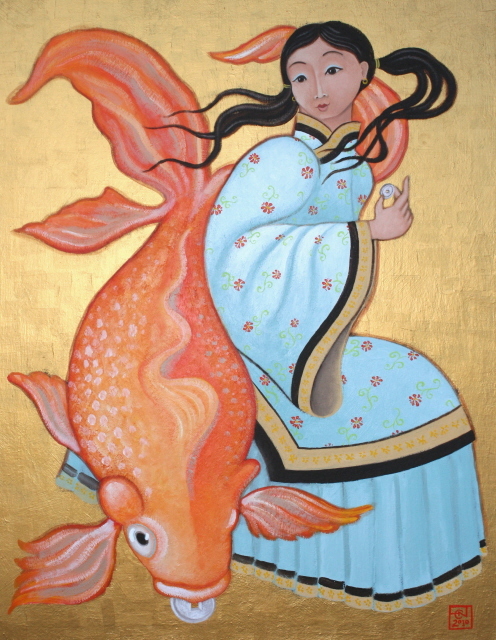 I wanted to show the painting here, because I TOTALLY love it, and it is hanging in my living room right now – just perfect for Chinese New Year. It is a metaphorical dream image of the parable of the lost coin, and I love the sense of movement and dynamism that I am exploring lately.